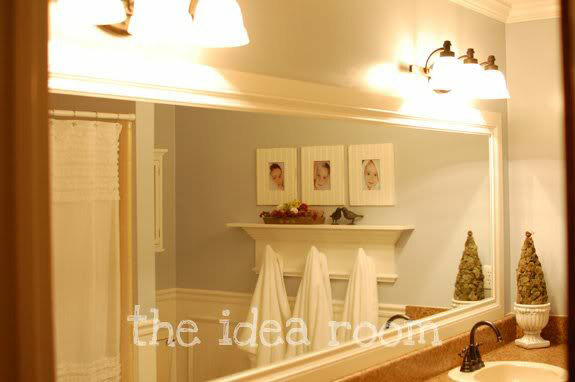 One detail that I didn’t put much thought into when we originally built our house was our master bathroom mirror. 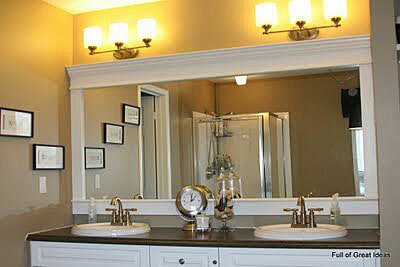 We went with the standard frameless mirror which serves it’s purpose but offers more function than style. It’s looking a bit bare and boring compared to the rest of the room. 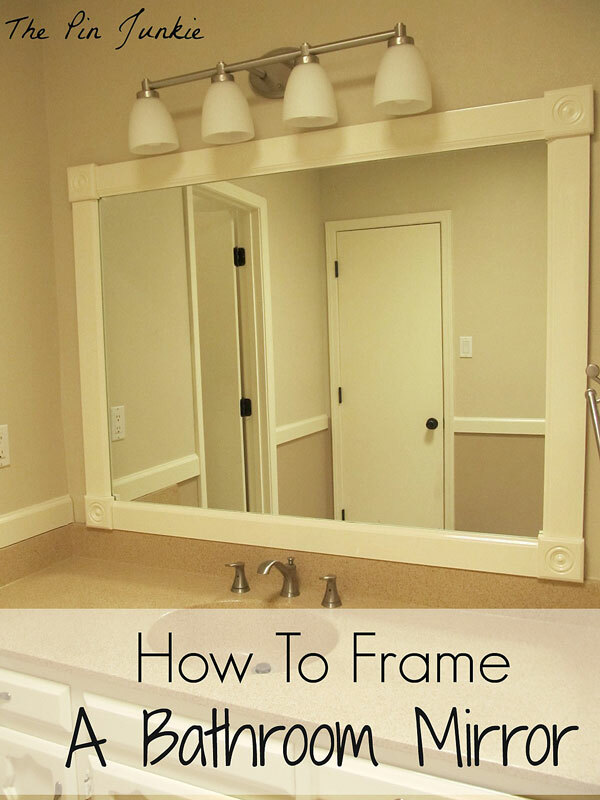 This has led me to start looking at DIY mirror frame ideas. 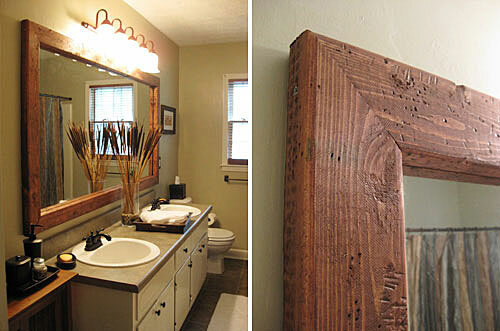 Since I have been seeing so many cool bathroom mirror frames, I definitely want to add a frame to our existing mirror. It should be a relatively simple project that I am hoping will add a lot of impact to the room. I’m thinking of trimming it out with a cream colored distressed wood. The plan is to attach the wood pieces directly to the mirror with construction adhesive. I could also go with a darker wood to give a little contrast. What do you think? 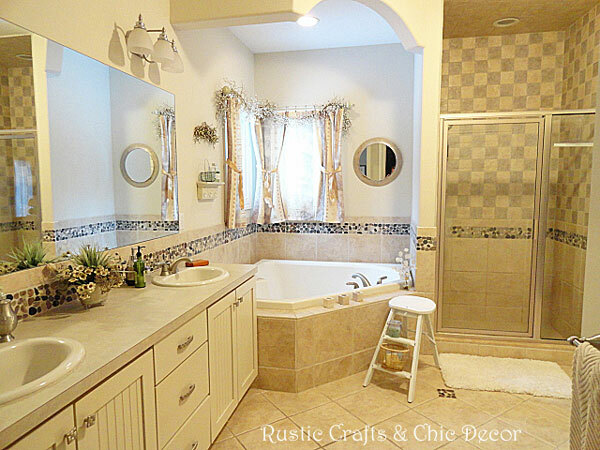 Here are some great examples that I found of some bath mirror frame ideas that I like. You can click on any of the photos for more details on each of the frames. I like the simple straight cuts and molding detail of this frame. If I don’t have to miter the corners, the job is just that much easier! This one shows a nice contrast with the darker distressed wood. A design like this could be the most forgiving of all. Those square corner pieces fit right over the cut lines for a seamless design. I’m liking the look of this design. The wood frame is actually made from baseboard. It gives just enough of a sculpted look to keep it interesting. Do you have a favorite? What would be your vote for my bathroom mirror? Just leave your suggestions in the comments below!